As you know, I have been trying to master making bread for over a decade. I’ve gotten my regular sandwich bread down to a science (psst…I do take small orders if you want fresh homemade bread in your house). It’s a honey wheat half-and-half bread. There are limited ingredients and I grind fresh flour each batch. You can find the recipe here. I have, however, had friends ask me to make gluten-free bread. As anyone with Celiac’s knows, finding a good gluten-free bread is like finding a needle in a haystack. Making it is just as hard. After some trial and error, I think I have a decent recipe to share with you. I am going to give you my two-cents about it though: it uses a lot of starch and a small amount of xanthan gum. It is my opinion that unless you have to avoid wheat, a homemade bread with fresh ground wheat is still the healthier option. My own daughter has had some skin issues, so she is going to go gluten-free for a month to see if it helps. I know the need is out there. I hope you enjoy this bread. 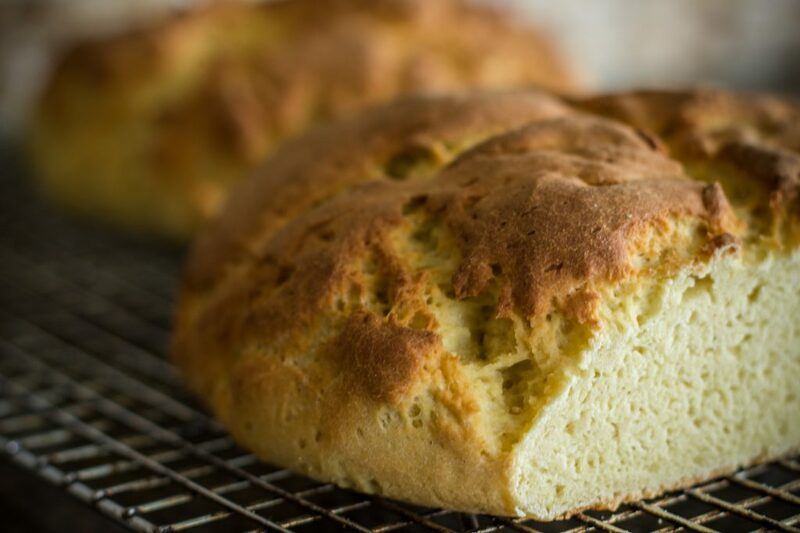 It’s easy to make and soft enough to be used as toast and sandwich bread. My GF quest isn’t over…I will keep tweaking the recipe and playing with it. As with any cooking project, it is more of a journey than a destination. Enjoy! All ingredients should be room temperature. In a small bowl, put 1 cup of warm water. (Can almost be hot). Sprinkle in the yeast, stir, and set aside. In a large mixing bowl, whisk together the flours, starch, salt, and xanthan gum. In another small bowl, mix the oil, honey, egg yolks, and the rest of the water. In yet another bowl, beat the egg whites to soft peaks. Pour the oil and proofed yeast mixture into the flour mixture. It should be thick but stirrable. Add more water if needed. Fold in the egg whites, then pour the batter into two 9-inch round cake pans that are greased, or put two mounds on parchment paper on a cookie sheet. Form the mounds as tall as possible with your hands. You’ll have to wet them a lot while you shape the dough. Cover the mounds loosely with plastic wrap that has been sprayed with oil. Let the dough rest 60-90 minutes. It will seem a little puffier but it won’t raise like normal bread. Bake at 400 degrees for about 30 minutes (I place the cake pans on a parchment-covered cookie sheet in case the dough boils over the edge of the pan). Insert knife into the center of a loaf to see if it is done. (DO NOT UNDER COOK). Allow the bread to cool completely before eating, unless you have an electric knife that can cut it without smashing the loaf. Keep the leftovers in a sealed bag in a refrigerator. The bread is good up to one week.